Lipoma may be classified as a benign neoplasm , that affects soft tissue. This tumor is related to mature adipose tissue , where it is commonly found in the mesenchymal region, according to the WHO classification. Lipomas represent the most common mesenchymal tumors and are found in regions in which adipose tissue is normally present. Occurrence of lipoma in the oral and maxillofacial cavity is rare; the frequency reported in the literature on oral lipoma (OL) is between approximately 1 to 5%. These tumors can attack the tongue, lips, gingiva, floor of the mouth, salivary glands and oral mucosa. Most OL are composed of mature fat cells, presenting as well-defined and covered by a thin, fibrous capsule4. Among the microscopic variations most commonly found are: classic lipoma, fibrolipoma, spindle cell lipoma, angiolipoma, salivary gland lipoma, and pleomorphic or atypical lipoma. 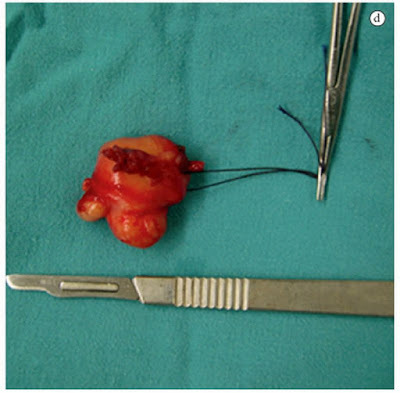 The purpose of the present study is to report a clinical case of a very extensive intra-oral lipoma, located in the mentonian region; also, to conduct a review of the literature about this tumor. The patient, a 62 year old woman with the primary complaint of swelling in the posterior region of the left mandible, approximately 2 years of asymptomatic clinical development, reporting paresthesia on the left side of the lower lip, as well as ipsilateral jugal mucosa. The patient claims no history of smoking, alcohol consumption or other clinically relevant situations. During the extra-oral evaluation there were no clinical signs of swelling The intra-oral clinical exam revealed the absence of all upper and lower dental elements, the presence of significant swelling in the posterior region of the left mandible extending to the region of the jugal mucosa, no signs of inflammation, the tumor was flaccid to palpation and had well-defined boundaries.